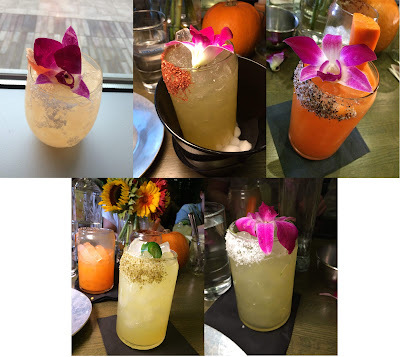 When The Minx told me that we were invited to a special media dinner at the new Vida Taco Bar location in Harbor Point, I wasn't quite sure where she was talking about. 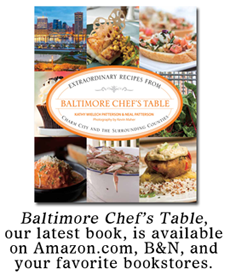 I didn't realize that the 27-acre former industrial site situated between Harbor East and Fells Point had been given a new designation. Along with the new name, Harbor Point is being developed into a modern site for office. living, retail, and dining spots, and Vida Taco Bar is one of its newest tenants. While Harbor Point is still very much a construction site, the completed buildings and streets are quite impressive and offer a terrific view of the harbor. As we arrived at Vida, mother nature was entertaining us with a spectacular sunset of orange and purple. To compliment the view, we were offered our first of five margaritas for the night. The Paloma is a blend of Altos tequila, ruby red grapefruit juice, and lime agave. Later, each course of tacos was paired with a particular margarita, which I'll get into in a moment. 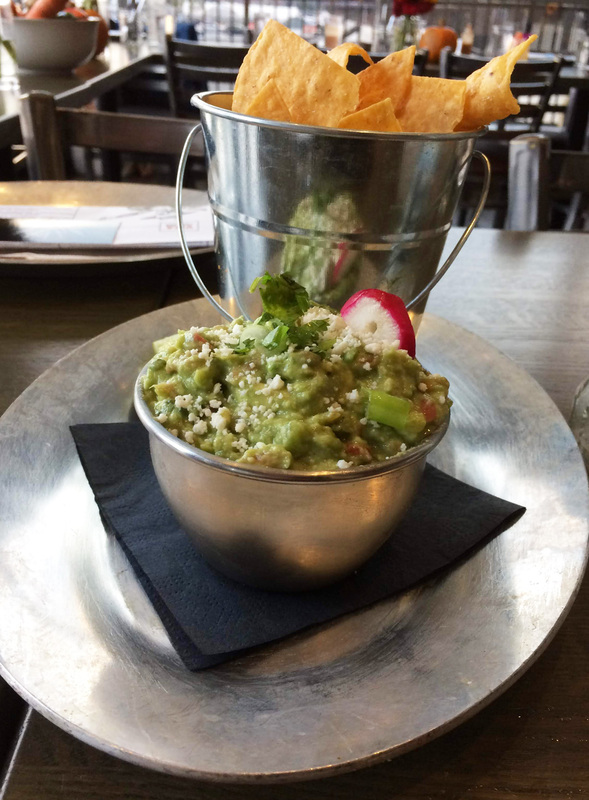 You can't really be a taco joint without serving tortilla chips and ours were paired with tangy and creamy guacamole made of avocado, jalapeño, tomato, red onion, scallion, lime juice, and queso fresco. Sometimes I feel like I could have a meal of just tortilla chips and guacamole, but I had to save room for the main event: tacos. Our first course consisted of two vegetarian tacos. 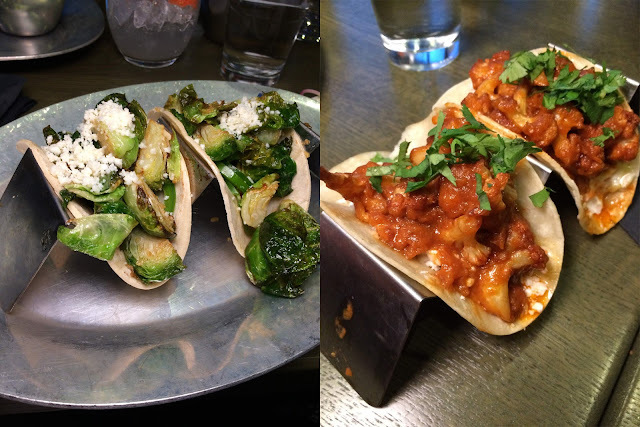 The fried Brussels sprouts taco had slightly crunchy fried sprouts topped with cherry bomb peppers mellowed out with spiced agave and queso fresco. The Buffalo cauliflower taco featured fried cauliflower and cabbage slaw covered in Buffalo barbeque sauce, queso fresco, and cilantro. I was really impressed with how much flavor and texture they were able to create without any protein. In fact, these were probably my favorite tacos of the night. They were paired with a smoked margarita made of Ilegal Mezcal Joven, Vida margarita mix, and a chipotle/cinnamon salt around the rim. To reinforce the smoky concept, the drink is served in a bucket of dry ice which, when hot water is added, smokes up like a concoction from Grandpa Munster's laboratory. The next course was a seared scallop taco served with roasted corn salsa, chipotle aioli, and queso fresco. I was concerned that the chipotle aioli might overwhelm the subtle flavor of the scallop, but the aioli, corn salsa, and queso fresco combination nicely complimented the perfectly cooked scallops. 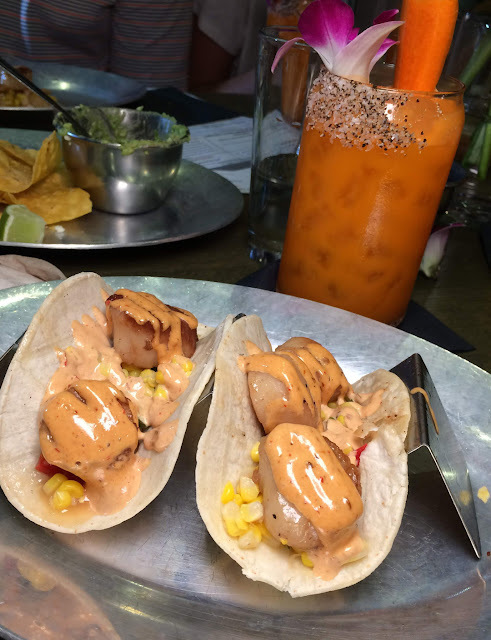 The scallop taco was paired with the 24 Carrot margarita: Suerte Reposado Tequila, carrot juice, gala apple, ginger, Vida margarita mix, and "dirty" salt. Full disclosure: I'm not a big fan of tequila, but I do like reposados and this particular margarita was my favorite. Such a great balance of sweet and spicy. Next up was a taco that hadn't been served in the restaurant before: seared mahi mahi topped with eggplant caponata, curry spiced fried chickpeas, and a curry vinaigrette. Since The Minx gets tummy upset from chickpeas, she removed them from her taco, which is a shame because the curry spice on the chickpeas gave the taco a certain Indian flair. Let's face it, mahi mahi is a pretty bland fish and it needs some spice to compliment its meaty texture. The margarita pairing was the Some Like It Hot, with jalapeño-infused Suerte Blanco tequila, Vida margarita mix, and a jalapeño-salted rim. I think this margarita had the most tequila flavor with a lot of heat and only slightly sweet. 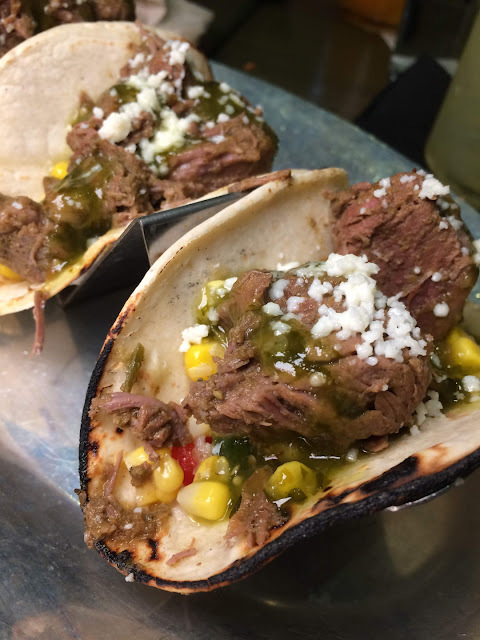 Finally, we were treated to the lamb barbacoa taco with roasted corn salsa, salsa verde, and queso fresco. The lamb is the star of this taco and there's quite a bit of it. While I would have preferred it to be more tender and shredded, the meaty chunks of lamb were quite moist and flavorful. 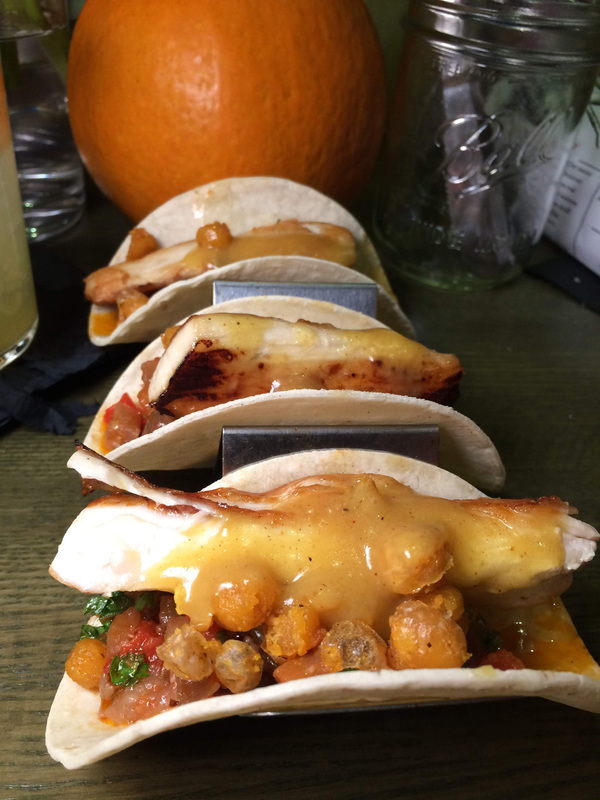 For this taco, we had a margarita made with Herradura (Double Barrel) tequila. This tequila is a Vida Taco Bar exclusive and was showcased with a mix of mojito lime, Valencia orange, Herradura agave, and sugar cane. A bottle of the special tequila was passed around so we could use it in our photographs. It turned out that the Herradura (Double Barrel) was a reposado as well, so I drained my water glass and poured a shot of the special tequila for myself. Its smooth, slightly smoky flavor lived up to the hype. Despite the variety of tacos and margaritas we experienced, there's still more on the menu I want to go back and try. 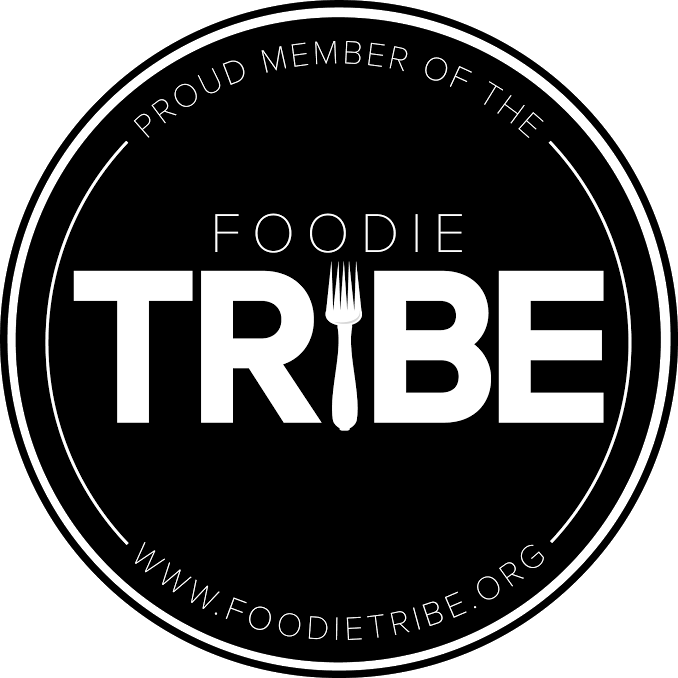 I'm especially eager to try their octopus taco and specialty tequilas.